By means of the Central Innovation Programme (ZIM), the Federal Ministry of Economy and Energy is promoting market based technological research and development projects in the medium-sized economy. Thanks to this promotion Kematec has been able to successfully complete numerous new developments for future-oriented beverage production and to introduce them into the market on a sustainable manner. As an innovative medium-sized company, Kematec plans to set also in future technological standards with further new developments. KEMATEC continues setting significant new standards for the processing of champagne capsules. Recently the latest generation of the Kematec SEKAM®- series had been commissioned in the Champagne region. From Piccolo to Magnum and from short capsule to long capsule, 8,000 bottles of champagne per hour are aligned and capsulated on this special edition production line . 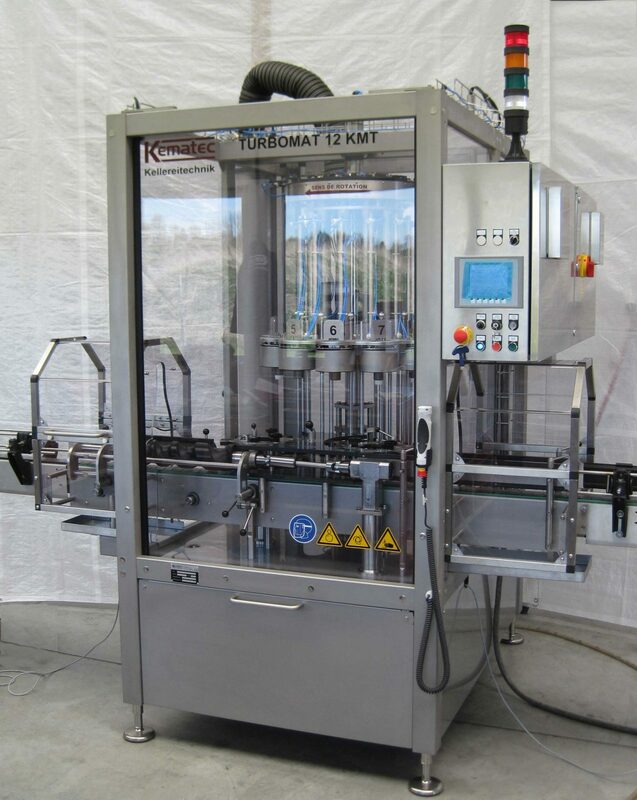 This latest version of the Sekam is a 2-carousel block machine with 8 processing stations each for aligning to bottle seam and capsule as well as pleating of champagne capsules. The innovation in orientation is in this case the integration of digital camera technology into a very compact machine. This compact design enables an extremely economical and ecological operation. Compared to other machines of similar type up to 30% energy can be saved. This digital camera technology allows the complete machine to be set for a new different type of capsule within only 2 minutes, without a mechanical position change of the orientation unit. In the 1st carousel with 8 stations, the bottles are first aligned to the bottle seam. Then, with a vacuum unit, the capsules are sucked in, raised, orientated and put back onto the bottles. A transfer star guides the bottles to the 2nd carousel. 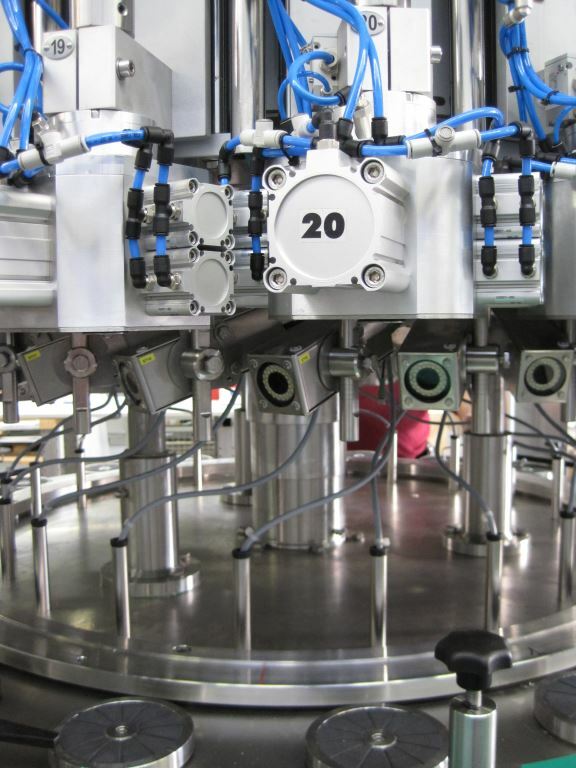 In this carousel with 8 stations the bottle with the capsule is as well turned into position for the pleating process and then the pre-pleating and pleating of the capsule is carried out in a single processing head. The special feature here is, that no additional carousel is needed for the pre-pleating and pleating of the capsule. Both folding processes run in one station and allow for this 8-head machine a pleating capacity of 8,000 b/h. KEMATEC installed test machines in the production lines of selected renowned champagne and wine cellars in Europe. The performance of these machines ranges from 3,500 to 12,000 up to 20,000 b/h. The effectiveness and efficiency of this machine type exceeded even the expectations of the KEMATEC designers. Due to constant further development and research with these test machines, the saving of energy in the drying technology within the smallest space is to be further increased. The KMT TURBOMAT®, patented in Germany and Europe, had been successfully tested to completely dry washed bottles, spending 50% less energy. We also run successful tests to blow off the condensation water of bottles directly before labeling, as well with an energy saving rate of over 50%. The control of the machine has been optimized so that the operator can adjust the drying performance at its best to the indoor climate of the production halls. This option allows an even higher energy saving potential than 50%. The geometry of the drying nozzles had been optimized so far by means of fluidic laboratory tests that bottles with a diameter from 60 to 90 mm can be run with one nozzle without set-up times. At the same time, our KEMATEC design engineers constructed a new system of bottle guide parts, which can handle cylindrical, conical and club-shaped bottles without changing stars. The absence of a clamping star is intentional, as these stars are subject to high wear. The new KEMATEC universal stars are almost wearless.